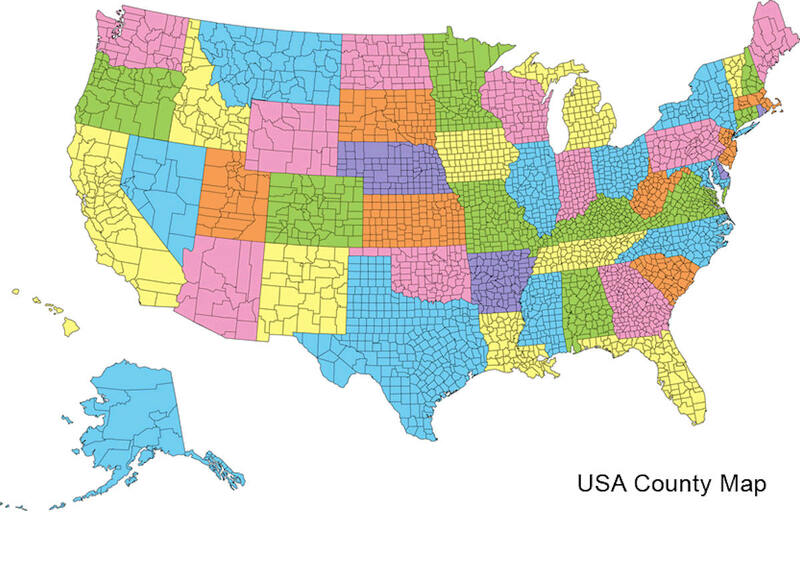 Delaware has three counties: New Castle, Kent, and Sussex, the fewest Counties of any US state. The origin of the county boundaries go back to former court districts. The powers of the counties' legislative bodies are limited to issues such as zoning and development. Sussex County is a county located in the southern part of the state of Delaware, on the Delmarva Peninsula. Based on the 2010 census, the population was 197,145. Sussex County was created on August 8, 1673 as an Original County (originally named Whorekill or Hoarkill, renamed 1681 to Deale or New Deal, renamed to Sussex in 1682). The county seat is Georgetown. The county was named by William Penn for the English county of Sussex, which was his home county. The first European settlement in the state of Delaware was founded by the Dutch in 1631 near the present-day town of Lewes. However, Sussex County was not organized until 1683 under English colonial rule. Sussex County is included in the Salisbury, MD-DE Metropolitan Statistical Area which encompasses much of central Delmarva. Sussex county was named in 1682 by William Penn for the English county of Sussex, which was his home county. Between 10,000 and 14,000 years ago, archaeologists estimate that the first inhabitants of Sussex County, the southernmost county in Delaware, arrived. Native Americans in Sussex County called themselves by the various tribal names of the Algonquin Nation. The most prominent tribes in the area were the Leni Lenape and Nanticoke tribes. The people settled along the numerous bodies of water in the area where they were able to harvest fish, oysters, and other shellfish in the fall and winter. In the warmer months they planted crops, and hunted deer and other small mammals as larger game was not present in the area. There is no universally agreed upon group known to be the first to settle in Sussex County. 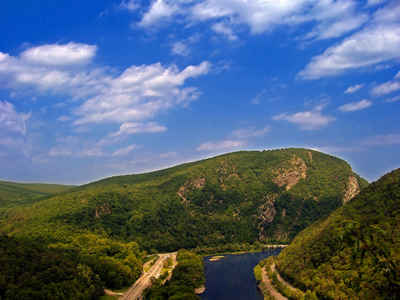 In the early years of exploration, from 1593 to 1630, many feel the Spanish or Portuguese were probably the first to see the Delaware River and the lands of present day Sussex County. Henry Hudson, on his expedition for the Dutch West India Company, discovered the Delaware River in 1609. Attempting to following him, Samuel Argall, an English explorer, was blown off course in 1610 and landed in a strange bay that he named after the Governor of Virginia, Thomas West, Lord De La Warr. In the first half of 1613, Cornelius Jacobsen Mey, a Dutch navigator, discovered and named both Cape May, New Jersey and Cape Henlopen, (originally Hindlopen) in the Delaware Bay. Later it was found that what May had named Henlopen, was actually Fenwick Island protruding into the Atlantic Ocean, and the name of the cape was moved to its present location just east of Lewes. Sussex County, was the site of the first European settlement in Delaware, a trading post named Zwaanendael at the present site of Lewes in June 3, 1631. Dutch captain David Pietersen De Vries landed along the shores of the Delaware to establish a whaling colony in the mid-Atlantic of the New World. The colony only lasted until 1632, when De Vries left. Upon returning to Zwaanendael that December, he found the Indian tribes had killed his men and burned the colony. The Dutch then set about settling the area once again. The original boundaries were undefined with boundary disputes between the family of William Penn, who claimed the county extended to Fenwick Island, and Charles Calvert, 5th Baron Baltimore, who claimed the county ended at Lewes with all the land south of that belonging to Somerset County[Sussex County, Delaware: USGenWeb Project]. Maryland and Pennsylvania both claimed the land between the 39th and 40th parallels according to the charters granted to each colony. The 'Three Lower Counties' (Delaware) along Delaware Bay moved into the Penn sphere of settlement, and later became the Delaware Colony, a satellite of Pennsylvania. In 1732 the proprietary governor of Maryland, Charles Calvert, signed an agreement with William Penn's sons which drew a line somewhere in between, and also renounced the Calvert claim to Delaware. But later Lord Baltimore claimed that the document he signed did not contain the terms he had agreed to, and refused to put the agreement into effect. Beginning in the mid-1730s, violence erupted between settlers claiming various loyalties to Maryland and Pennsylvania. The border conflict between Pennsylvania and Maryland would be known as Cresap's War. The issue was unresolved until the Crown intervened in 1760, ordering Frederick Calvert, 6th Baron Baltimore to accept the 1732 agreement. As part of the settlement, the Penns and Calverts commissioned the English team of Charles Mason and Jeremiah Dixon to survey the newly established boundaries between the Province of Pennsylvania, the Province of Maryland, Delaware Colony and parts of Colony and Old Dominion of Virginia. Between 1763 and 1767, Charles Mason and Jeremiah Dixon surveyed the Mason-Dixon line settling Sussex County's western and southern borders. After Pennsylvania abolished slavery in 1781, the western part of this line and the Ohio River became a border between free and slave states, although Delaware remained a slave state. In 1769 there was a movement started to move the county seat from Lewes to the area then known as Cross Roads, the present day site of Milton. 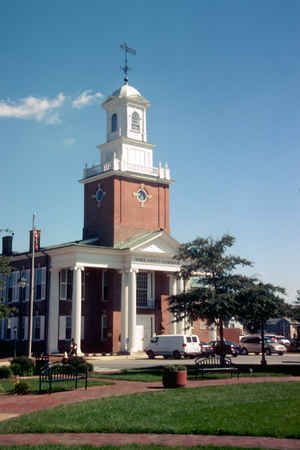 The current county seat of Georgetown was settled upon on January 27, 1791 after residents in western Sussex County successfully petitioned the Delaware General Assembly to move the county seat to a central location as roads at the time made it too difficult to reach the county seat in Lewes. Georgetown was not a previously established town and on May 9, 1791, the 10 commissioners headed by President of the State Senate George Mitchell negotiated the purchase of 76 acres and Commissioner Rhodes Shankland began the survey by laying out "a spacious square of 100 yards each way." Eventually the Town was laid out in a circle one mile across, centered on the original square surveyed by Shankland and now listed on the National Register of Historic Places. Georgetown was named after Senate President George Mitchell. 1609 - Henry Hudson and his crew aboard the Half Moon enter the mouth of what will become known as Delaware Bay. 1631 - Dutch established a trading post in what is present-day Lewes, calling the colony Zwaanendael, or "Valley of the Swans". 1681-1682 - The King of England grants Pennsylvania and Delaware to William Penn, an English proprietor who names Delaware's southernmost county for his home county of Sussex in England. The land grant sets off years of disputes with the Calvert family of neighboring Maryland, who challenge the boundaries between Delaware and Maryland. 1704 - Delaware, also known as the "Three Lower Colonies,"is established as its own government independent of Pennsylvania, though still under English rule. 1763 - Deep Creek Iron forge established outside Georgetown; iron working industry begins in Sussex County. 1768 to 1774 - English surveyors Charles Mason and Jeremiah Dixon survey the boundary of Delaware, beginning in Delmar, working their way north to Pennsylvania and then west for the boundary between Pennsylvania and Maryland; the survey formalizes the boundary, and thus brings an end the decades of dispute that began with the Penns and Calverts. 1776 to 1783 - Revolutionary War. 1791 - Georgetown platted out and established as the new County seat; the County seat had been located at Lewes, but was relocated to a more central portion of the County. 1813 - Lewes bombarded by the British during the War of 1812. 1830s to 1840s - Canning industry begins. 1859 - Railroad reaches Delmar. Farmers are now able to ship perishable goods outside of Delaware to cities such as Wilmington, Philadelphia and Baltimore. 1860 to 1865 - The Civil War period sees Delaware become a border state, siding with the Union. But Confederate sympathies run deep in southernmost Sussex County. 1871 - Strawberries first planted near Selbyville. 1872 - Rehoboth Beach founded as a tent revival meeting grounds. 1878 - Rail line reaches Rehoboth Beach; popularity of beaches spreads south. 1903 - Sussex County Levy Court is abolished by Delaware General Assembly and reformed as a 10-member panel. 1915 - The Delaware General Assembly again abolishes and reforms the Levy Court, this time as a three-member board of commissioners; the new Levy Court takes effect in 1917. 1919 - Last ship built in Bethel, which had been a popular ship-building port along Broad Creek, a tributary of the Nanticoke River and Chesapeake Bay. 1923 - Cecile Steele of Ocean View orders 50 chicks for her egg-laying business, but instead receives 500 birds thanks to a clerical error. The foul-up gives birth to the modern broiler industry, and will make Sussex County not only the birthplace, but the leading county of broiler production in the United States. 1924 - du Pont Highway opens, connecting Sussex County to points northward. 1943 - Levy Court of Sussex County purchases ground near Georgetown for airport. US Navy, and later a private firm, All American Engineering, use the property for training and testing grounds. 1970 - Sussex County, by authority of the Delaware General Assembly, shifts from Levy Court system to County Council form of government. Two Council seats are to be added to the new County Council, beginning with the legislation's effective date of Jan. 1, 1971. That act brought to five the total number of elected members on the panel. 1974 - Sussex County Council adopts first official County flag, a design based on merged imagery: the Dutch flag and the sheaf of wheat from William Penn's County seal. The flag was designed by William C. Scott of Selbyville. 1996 - County offices relocate from the Sussex County Courthouse on The Circle in Georgetown to the current County Administrative Offices building next door. 2006 - Robert L. Stickles, the longest serving County Administrator under the County Council form of government, retires. David B. Baker appointed as County Administrator. As reported by the Census Bureau, the county has a total area of 1,196 square miles (3,097 km2), of which, 938 square miles (2,428 km2) of it is land and 258 square miles (668 km2) of it (21.58%) is water. Sussex county is located in south Delaware. The eastern portion of the county is home to most of Delaware's beaches and many seaside resorts. The western side of the county is center of Delaware's agriculture industry with more acres of arable land under cultivation than anywhere else in the state. Sussex County is served by eight public school districts. The county also contains one charter school, the Sussex Academy of Arts & Sciences. Those state funded public high schools which participate in sporting events are members of the Henlopen Conference. There are several private schools in Sussex County: Bible Center Christian Academy (Laurel), Children Craft CO (Seaford), Delmarva Christian High School (Georgetown, Destiny Christian School (Georgetown), Eagle's Nest Christian School (Milton), Epworth Christian School (Laurel), Greenwood Mennonite School (Greenwood), Harbor Christian Academy (Ellendale), The Jefferson School (Georgetown), Jesus Is Lord Christian Academy (Georgetown), Lighthouse Christian School (Dagsboro), Lighted Pathway Christian Academy (Seaford), Milford Christian School (Milford) and Seaford Christian Academy (Seaford). There are several colleges and universities in Sussex County. Delaware Technical Community College has the largest presence in the county, but students can also attend Delaware State University, Goldey-Beacom College, University of Delaware, Wesley College all in Georgetown, the Philadelphia Bible College in Ellendale, and the Beebe Hospital School of Nursing in Lewes. The University of Delaware also maintains a marine science campus in Lewes.